The energy systems that our bodies use for different activities require a myriad of varied complex metabolic pathways. So depending on the type of work and sport you do will determine what type of training is required (yes – your occupation is considered as an athletic event) and what type of fuel you’ll need to put into your system. As an adaptable species with an instinct leaning towards survival, the majority of the population assumes that we’re able to “get away with” poor/inadequate nutrition, lack of regular movement, inactivity and minimal exercise. If this was the case, to put it bluntly, we wouldn’t be getting so fat, out of shape, and suffer from the fate of chronic lifestyle diseases. Eventually poor lifestyle choices will catch up with you in the form of injuries, diseases, illnesses, allergies, intolerances and conditions. I’m astounded that people continue to consume foods and fluids that are processed, full of refined sugars (and other forms of “natural” sweeteners), fortified with added nutrients, preservatives and potentially harmful food additives listed as numbers. Yet they expect their bodies to function normally and even demand additional performance outputs. I continue to enjoy learning what nutrition my body responds to best when I’m placing additional stress on it – working long hours (Chiropractic, Massage, Personal Training), exercise, training and racing. Following a solid week of 4x rides, 2x runs, 2x swims and 2x Pilates sessions, I tested my running legs yesterday for 15.5km at the annual Run for the Kids event. In days gone by, I would have devoured a large bowl of pasta the night before the event, followed by a morning pre-race snack of crumpets or white bread with jam or honey to top up my glucose stores. Hydration would have been plentiful ensuring not to get “dehydrated” (more of that in an upcoming blog post). A coke would have accompanied my dinner (to sneak in a few extra carbs) and I would have been sipping on electrolyte replacement drinks in the days leading up to the race. During the event I would grab as much sports drink as I could get my hands on to continually top up my fuel supplies. How times have changed! In the past two to three years I’ve done a complete 180 degree turn around on my nutrition strategy – both in general and for training/racing. And I feel 100% better for making these changes. Antipasto plate – olives, prosciutto, feta cheese, grilled veggies, saganaki cheese. Rusty (my training mate, and “brother from another mother”) and I planned to meet at the start line and enjoy a steady paced Sunday run with 35000 of our closest running buddies. I cycled in to the city which was a great way to warm up my muscles from a hard ride and run the day before. I found Rusty near the start line sipping on his takeaway coffee (he’s also been an early adopter of Low Carb High/Healthy Fat nutrition). We had no choice but to start off the run easy as we were wedged between thousands of runners. The road opened up after 3km and we found some space and a good rhythm. As is often the case, it’s not that easy to run within your comfort zone when there’s a race going on around you. Clearly we were both feeling good and our “pace creep” at the 7km mark was reflecting that. The last 8km were run below 4min/km pace. I don’t use a GPS running watch (yes – I’m old school), so there is no data to go with that statement. However, with 20+ years of distance running, I’m pretty good with predicting my running pace. 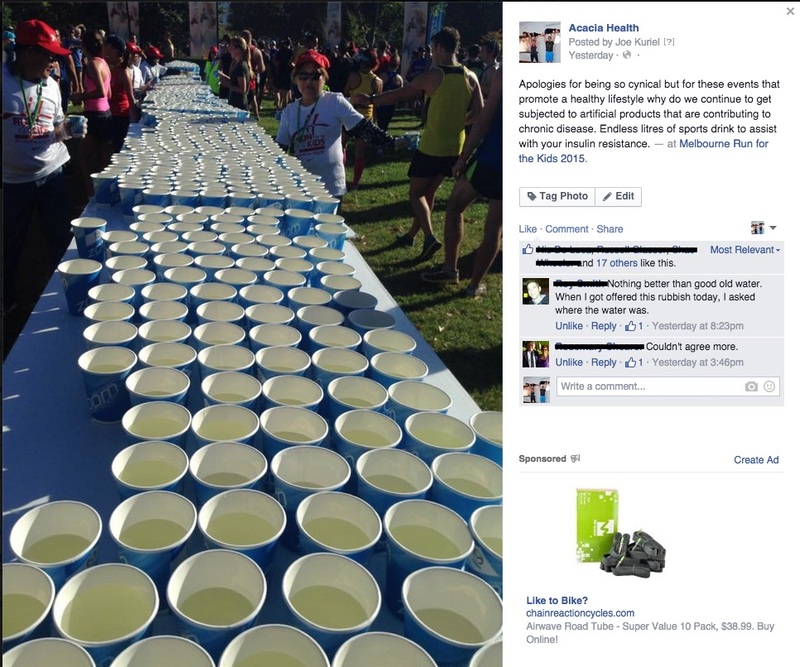 After crossing the finish line there were 2 hydration options – water and sports drink. I’ve never been one to be a conspiracy theorist, however the more research and reading that I do, the clearer the lines become between the sports nutrition industry and the associations they support, the research (and researchers) that they fund, the athletes they endorse and the events that they sponsor. I wonder and fear that we’ve gone beyond the point of no return. The interests lie more in the profit margins of big business and less in the welfare of humanity. Besides going for an hour walk this morning I haven’t done any other exercise today. My legs are a little tight and tired from the effort yesterday, although that was to be expected. I’ll train as per usual this week and bookend my week with an Olympic Distance Triathlon on Sunday – 1500m swim, 40km ride, 10km run. I’m looking forward to testing my body again (nutritionally and physically) in an event that demands speed, strength and endurance.